PHINMA Corp. is energizing not only Visayan households but Guimaras island as well -- by helping it increase its tourism potentials, the company's head for corporate affairs, Danielle del Rosario, said. PHINMA Corp., through its wholly-owned subsidiary Trans-Asia Renewable Energy Corp. (TAREC), is operating a 54-megawatt wind farm in San Lorenzo, Guimaras, which provides power to some 48,000 households in the Visayas region. Del Rosario said the construction of their maiden wind farm on the pristine island has opened doors for them to help improve the lives of the local residents. “Before, it was just known as a mango capital. So now, there is another destination — the wind farm,” she said, adding that the wind farm has already earned the tag of “selfie destination”. 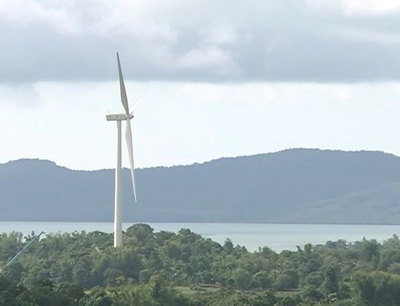 The San Lorenzo wind farm has already become a tourist destination, attracting lots of local tourists from nearby provinces, such as Iloilo and Negros. She said their company has teamed up with local government units, tourism offices and local communities in creating livelihood opportunities to increase the revenue of the province. For instance, locals have been taught how to silk screen T-shirts they could sell during festivals and other big occasions. They have also put up "pasalubong" centers, where tourists could buy souvenirs such as miniature wind turbine and other native products of Guimaras. Since PHINMA is also into the hotel business, del Rosario said they are helping small hotels and accommodations improve their services and are encouraging entrepreneurs to go into the bed-and-breakfast business for the influx of tourists during festivals. “We really work with the community and find out what are their existing skills, what are the existing resources also in the community. Work with them to come up with livelihood initiatives that they will also like,” she said, adding that PHINMA is also searching for other areas to develop into tourist sites. She noted that Guimaras has the potential to become an ecotourism site for bikers and sailors. The company supports the annual Paraw Regatta Festival in Iloilo, which she said can be also be done in Guimaras; and the activities of the Guimaras: Bike Paradise of the Philippines dubbed "Padyak Kalikasan, Padyak Kaligtasan and Padyak Kalusugan". With the continuous development in Guimaras, del Rosario bared the local government's plan to apply to become a second-class municipality from fifth-class municipality. The Department of Tourism (DOT) regional office here is readying its newest undertaking known as the ‘Market Day Tourism’ in public markets here and the province Guimaras as project pilot areas. DOT regional director Atty. Helen Catalbas said Guimaras helps make tourism of Iloilo City more attractive and competitive and both local government units are complementing each other with Guimaras as a major food producer and the city as the consumer. Catalbas is positive that Guimaras is one of the biggest suppliers of food for tourism-related establishments in Iloilo City. She said Guimaras may not have big volume of tourists but it is one of the primary sources of food and other fresh resources served to tourists here. The island province of Guimaras is not just the source of the sweetest mangos in Western Visayas but also the provider of poultry products, pork and beef, fishes and a variety of fruits. It also serves as an attraction of residents and tourists of Iloilo City, she said. Catalbas also urged the local government units of Guimaras to record all products the province is supplying to Iloilo City for these figures can be used to determine the effect of tourism to the daily lives of the Guimarasnons. She added they greatly contribute to the tourism industry of Western Visayas.